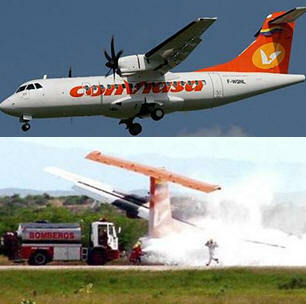 September 14, 2010 - Conviasa Airlines (ICAO - VCV), Flight 2350 had departed about 8:15 AM on Monday from Santiago Marino Caribbean International Airport in Porlamar (PMV) on Margarita Island, Venezuela. Which is situated in the Caribbean Sea, off the northeastern coast of the country. The scheduled flight was bound for Puerto Ordaz Airport (PZO), Puerto Ordaz, Venezuela. Onboard the French-built twin-engine turboprop, ATR-42 aircraft, were 47 passengers and 4 crew members. Within moments from takeoff, the captain, Ramiro Cardenas reported he was having difficulties controlling the aircraft. About 9:50 AM, Flight 2350 crashed about 6 miles from Puerto Ordaz Airport located in the city of Puerto Ordaz, which is one of Venezuela's largest cities and home to large settlements of iron and steelworks. The aircraft went down on the property of a state-run Siderurgica del Orinoco steel foundry. At least 15 onboard are confirmed dead and 27 have been hospitalized at local Puerto Ordaz hospitals. Upon impact, the aircraft burst into flames, but do to the early warning given by the pilot of his situation, authorities were able to assemble emergency responders and equipment to the seine. The emergency responders were able to quickly extinguish the aircraft fire, get the passengers out of the aircraft and get the injured to area hospitals. The weather at the time was reported to be partly cloudy with scattered cloud layer at 27,000 feet, 91° F, the wind was from the east at 9 MPH and visibility was reported at 6 miles. The ATR 42 is a twin-turboprop, short-haul regional airliner built in France and Italy by ATR (Aerei da Trasporto Regionale or Avions de Transport Regional). The name "42" comes from the aircraft's standard seating, which varies from 40 to 52. Conviasa Airlines is a state-owned airline with its headquarters on the grounds of Simón Bolívar International Airport in Maiquetía, Venezuela, near Caracas. It operates services to domestic destinations and to destinations in the Caribbean and South America. Its main base is Simón Bolívar International Airport, the airport that serves Caracas. Conviasa is the second Latin American airline to fly to Asia, after Aeroméxico. In January 1997, Venezuela's flag carrier, Viasa ceased operations after 37 years of service due to prolonged financial problems. In May 2001, the idea to create a new flag carrier for Venezuela was proposed, but in December 2002, the project was put on hold until October 1, 2003. On March 30, 2004, the President of Venezuela, Hugo Chávez, signed a decree that formally established the airline. This decree was published in the nation's official gazette the next day. On 28 November 2004, Conviasa's inaugural flight was made with a De Havilland Canada Dash 7 aircraft flying from the airport in Charallave to the Santiago Mariño International Airport, on Margarita Island. On December 10, 2004, Conviasa formally began its national and international operations. Conviasa was originally run by the now extinct Ministry of Production and Commerce, but it has since been taken over by the Ministry of Infrastructure.